In today's world, investing has never been easier for those who are just starting out. There are several platforms out there that are very investor friendly. I thought I'd take a few moments to give my review of one of those platforms I use called Robinhood after one year of using it to purchase dividend stocks. Robinhood is a broker that is backed by FINRA and is SIPC insured. Because they are federally registered and monitored, this should alleviate any concerns that prospective Robinhood users have about if Robinhood is legitimate. Robinhood is able to charge no fees or commissions because they earn interest income on any uninvested cash in the brokerage accounts of their customers. Secondly, Robinhood makes money off of margin account interest when Robinhood Gold users utilize the margin feature. Lastly, Robinhood earns money by offering the Robinhood Gold service to users for $10-$25 a month. This service allows Robinhood users unlimited instant reinvesting, instant deposits, and added buying power. User Friendly App/Website: Because Robinhood is a fintech company that seeks to democratize the process of investing, they have no account minimum to open an account. Regardless of if you have no money to invest or $50,000 to invest, you can open an account. Opening an account is very easy and user friendly. It took me about 5 minutes to provide the necessary information to have my account approved a couple days later. Linking a bank account in order to be able to invest was also a very quick and easy process. Also, since I joined Robinhood, they have added a desktop site for users to check their accounts. Investing Options: Robinhood has ramped up the number of investing options that are available to its users. Since I started my account last August, they have added options trading and cryptocurrency. I'll probably never use either of these new features, but for anyone that would like more options than just stock investing, Robinhood has become a great platform for so much more than just stock investing. Free Commissions: As I alluded to earlier, Robinhood charges no fees or commissions. This can save users of Robinhood quite a bit of money. Diversification: Because Robinhood charges no fees or commissions, I've been able to invest small amounts of money into a wide variety of great dividend paying stocks. At the time of this article, I'm invested in 31 different companies through my Robinhood account. My investments in companies range from as little as $150 to over $500. The larger investment holdings in my account weren't even built in one purchase either. I've been able to average down my cost basis on positions like AT&T (T) and Exxon Mobil (XOM) through several purchases over time. I've had 52 transactions since I signed up for Robinhood which has easily saved me hundreds of dollars in fees. If not for investor friendly platforms like Robinhood, I'd have to invest much more money in fewer positions to not accumulate so much in fees, which would sacrifice the diversification of the portfolio. Customer Service: To this point, the only interaction I've had with customer service was when I didn't receive my dividend from Royal Dutch Shell (RDS.B) a few days after the dividend pay date back in March of this year. This was when I wasn't aware that it can at times take longer for ADR shares to deposit dividends into your brokerage account. I emailed customer support and they promptly informed me of this. The dividend was deposited into my account a few days later just as they said it would be. Order Types: Robinhood offers a variety of order types for users looking to buy or sell stock. There is the market order type that allows you to buy x amount of shares for whatever the most recent market price is. If one is looking to buy a stock for a specific amount, they can place a limit order stipulating the maximum price they are willing to pay for shares of a stock. The order isn't executed until the stock is at or below the demanded price. An investor can set the limit order to be good through the end of a trading day or until the trade is executed. Free Shares of Stock: When one signs up for Robinhood, they have the choice to use a referral code in order to get a free share of stock from Robinhood. Both the referrer and the referred party receive a free share of stock. You have the opportunity to get your hands on a share of stock like Apple, Facebook, Microsoft, GE, Ford, etc. The maximum monetary value of stocks that one can be rewarded through using a referral code when they sign up, and for anyone they refer to Robinhood is $500. If for instance, one has received $490.00 of stock from Robinhood, they can only receive a share of stock worth $10.00 or less for referring someone else because of the $500 cap. Robinhood calculates the amount you are rewarded as whatever the stock is worth whenever you receive it from Robinhood. Please note that you cannot sell the stock you receive until 2 days after you received it, and you can't transfer the proceeds of the sale to your linked bank account until 30 days after you are rewarded the stock. If you are interested in signing up for Robinhood and getting a free share of stock, I'll include my referral link in this section of the review. No Automatic Dividend Reinvestment: For those looking to for the ability to automatically reinvest their dividends into a company through a DRIP, this is one of the very few drawbacks to Robinhood as they don't offer this service at the time of this post. This is something that doesn't personally doesn't bother me that much as I prefer to let my dividends build up in my account, so that I can opportunistically buy whatever dividend stock I believe to be most compelling at the time. No Retirement/Custodial Accounts: Unfortunately, Robinhood doesn't offer retirement accounts such as the IRA or Roth IRA at this time, nor do they offer custodial accounts for those looking to open an account for minors. I'd absolutely like to see these options added at some point in the future as this would be icing on the cake given how much I already love Robinhood. Not Available Outside the US: Robinhood is not licensed anywhere besides the United States. Therefore, international readers are unfortunately unable to sign up for Robinhood at this time. No research platform: While Robinhood doesn't have much of a research platform, I don't find this to be much of a problem anyways. I use Morningstar for most of my research, so expecting a value conscientious app to offer a top notch research platform is simply unrealistic. 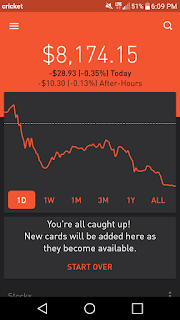 If you need an all in one investing app, this lack of a platform may be disappointing to you. Like any other brokerage account, Robinhood has its advantages and disadvantages. 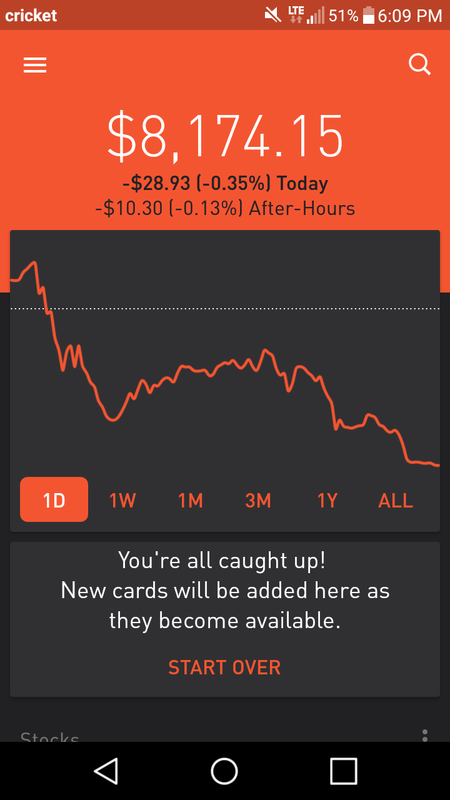 For any new or experienced investors alike looking for an app that has value and utility in mind, I highly recommend Robinhood. I wouldn't even bother writing a review of Robinhood or continue to maintain an account with them if I didn't truly believe in Robinhood. What are your thoughts on Robinhood? Did I miss any important points in my review of Robinhood? Do you have a brokerage account through them? If not, what is the biggest drawback that you'd like to see modified? Thanks for sharing your feedback on Robinhood. They are one of the options I have looked at for my son, however seeing that they don't offer IRAs at this point I would suspect that means that they don't have custodial accounts either. I think they, and other options like them, are good options with the lack of transaction fees. There are a lot of investors that don't have large sums of capital to invest at one time, but this gives them an option without being hammered by fees. That's actually a great point. I never considered mentioning that Robinhood doesn't offer custodial accounts. Thanks for bringing that to my attention.